The Joy of Tech comic... 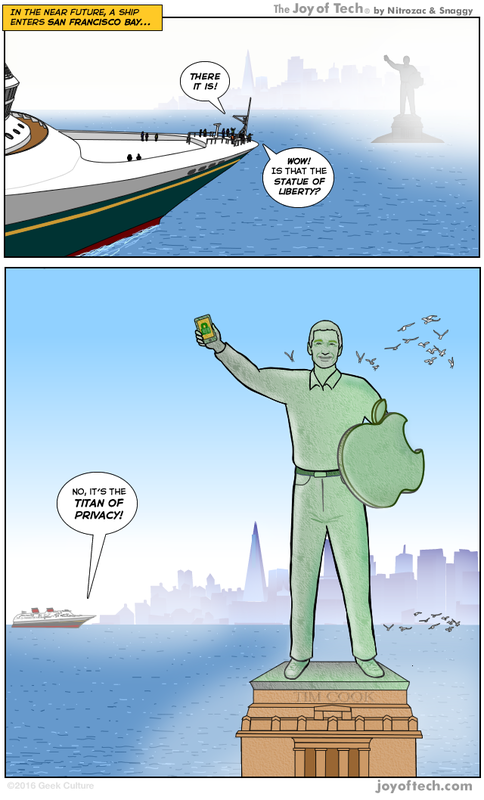 The Titan of Privacy! How do you feel about the US government demanding Apple create a way to decrypt that terrorist's iPhone? Apple should comply, there might be something on that phone that would be useful to protect people. I'm with Tim Cook. This request is an dangerous precedent which threatens the security of everyone, and has implications far beyond this particular case. I'm undecided, this case is complicated. This is a fantastic opportunity for a hacker looking to sell some software to the FBI. Shoosie launches Which is your favorite spacecraft?, ... Stibbons is getting started with big data and machine learning, ... and TheMoMan has some News from the LHC! SuperFan Subscriptions! Get access to the SuperFan Clubhouse, custom avatars in the Forums, and more! We've been making comics on the web since early 1999, and The Joy of Tech is now in its, whoa... 16th year. We're very proud to be featured regularly on places like re/code!